Published in the Dover Express, 4 July, 1980. In March 1852, the tender of Messrs Lee was accepted for forming the quays, making the roads and arching over the Dour from New Bridge downwards to a distance of 330ft., where the river now discharges. In the excavations, which were made a little below New Bridge 12ft. under the original bed of the river, was found an extensive deposit of peat about a foot thick, and among the vegetable remains was found the tusk of a wild boar. The peat formation was regular, appearing to extend sea* ward and landward. The stream of the Dour which, until 1852, could be seen from the parapet of New Bridge, waa confined to a culvert from 10ft. to 14ft. in diameter, and the ground over it filled up and levelled for building purposes. The brickwork of the culvert was made specially strong to take the weight of future superincumbent buildings. By the use of Medina cement, the bricks were, before being placed in situ, formed into masses 2ft. long, with a view to securing greater solidity. Over this culvert stands the end of Cambridge Terrace. The now demolished Jewish synagogue and the Volunteer drill hall, which was originally built as a racquet court for the use of the officers of the garrison, also stood there. From the top of the Pent, the quay wall was carried in a straight line, leaving outside it a large part of the shallow bed of the Pent for road and quay space, the area of reclaimed land growing wider in the direction of Commercial Quay. The filling up behind the quay wall, to the level of the wharf and road, was expeditiously done with mud and rubbish, dredged from the Pent at the rate of 350 tons per day, the formation of Northampton Street being completed in the early part of 1854. Why the new thoroughfare was named after a Lord Warden who ruled so long ago as 1604, and who ruled with so little benefit to Dover, when the name of a much later and greater Warden, Wellington, wjuld have been much more appropriate, it is difficult to imagine. The opening of this road was a great relief to the congested traffic of Upper Snargate Street, and, in later days, made it possible for the electric trams to find a convenient route to the Pier. Slip Passage, leading from Northampton Street across the upper end of the Wellington Dock, was so named because it formed the approach to the Patent Slipway constructed in 1850. Cambridge Road was laid out by the Harbour Commissioners, in the year 1834, and was handed over to the Paving Commissioners in 1835 at the same time that Waterloo Crescent was built. The land on the Wellington Dock side of this road had not then been fully utilised. The quays were commenced while Mr Fordham was harbour engineer, prior to 1834, and they were completed in 1841 by Messrs P. and T. Treadwell, contractors. In 1845 Ordnance Stores were built adjoining the Ordnance wharf. These were rebuilt and much enlarged in the late 1880s. The greater portion of this road, on the harbour side, is occupied with shipbuilding yards, a part having been rebuilt in 1903, and held by the Marine Department of the S.E. and C. Railway as shipwrights’ shops. Lower down, is the Harbour Board’s enclosed crane yard, and, below that, an open quay extending to the Wellington Bridge. The dockside shipbuilding yards in Cambridge Road have conveniences for building and launching small sailing ships for which they and the adjoining slipway were well adapted at the time when ships were smaller and built with wood. A century ago from 40 to 50 shipwrights found constant work in Dover. The last wooden vessel was built on the slipways in 1878. The Bay Crescent, including Athol Terrace, East Cliff, Marine Parade, Camden Crescent, Waterloo Crescent, Esplanade, and New Bridge. The Bay Crescent, or Sea Front, as it is usually called, includes the Esplanade, Waterloo Crescent, Marine Parade, East Cliff, and Athol Terrace. This used to be the visitors’ quarter of Dover, the objective of all excursionists, the grand show place where crowds gathered to see the shipping, including battleships and Atlantic liners, to witness regattas, fireworks, military tattoos, feux de joie and other popular demonstrations, which, from time to time, took place. Today the castle, and its grounds and the views from the great Norman Keep are probably the chief draw. When “stormy winds do blow,“ those who like to brave the elements come to the sea front to watch the waves and sea spray dashing "mountains high.“ Once, «n peaceful summer evenings, visitors and townfolk promenaded under the dazzling illumination of a thousand electric lights. The view from the cliffs above what is now the Eastern Docks looking towards Athol Terrace and East Cliff before the Admiralty Harbour was built. 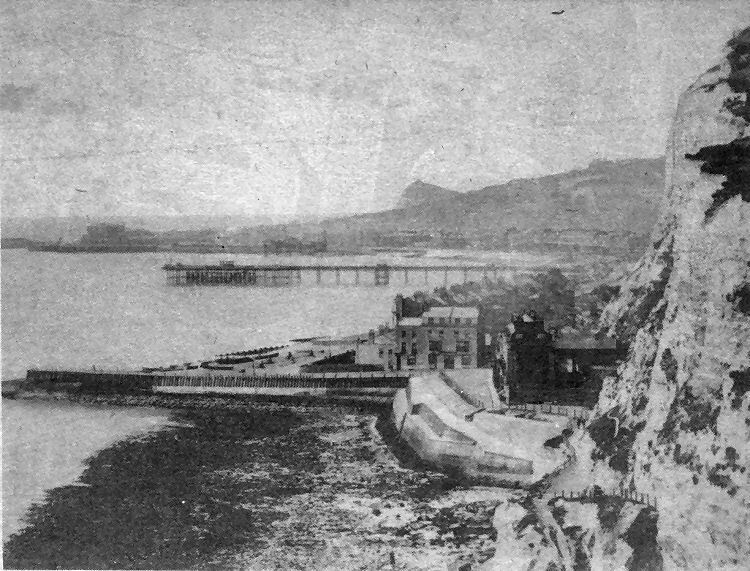 The Promenade Pier had not been completed and work had only just begun on constructing the Prince of Wales Pier beyond it, when this photograph was taken In the early 1890s. The Promenade Pier was opened in May 1893, construction work having started in 1891. Building of the Prince of Wales Pier began in late 1892. Note the extent of the shingle at East Cliff. The picture, above, shows work well under way on the construction of both the Eastern Arm and the extension of the Admiralty Pier.